Please note that registration for new cultural program pariticpant is now closed. The below link is for students of those schools who have already registered to perform. Remalaya is partnering with Ayyappa Samaaj for the second year, and will be coordinating the cultural program. This is the ONLY cultural event by Ayyappa Samaaj, conducted every year. It is always a SOLD OUT event. Please register ASAP as we have extremely limited number of seats/time available for our grand feast and cultural program. 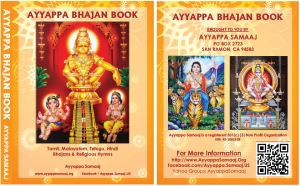 Ayyappa Samaaj has been conducting Vishu - Ugadi - Tamil New Year events for the past 10+ years. We are appreciative of the overwhelming support by the community, and looking forward to meeting all from the community at this years event. Vishu - the first day of the Solar New Year, also known as the mesha-sankranthi is a day of significance to Hindus all over the world. This transitional day is celebrated across cultures as Ugadi, Yugadi, Baisakhi, Songkran etc. by our ancestors who had lived in harmony with nature, in a dharmic way. Ayyappa Samaaj is happy to have Remalaya supporting us with organizing the Vishu cultural program. Remalaya is a brand new non-profit organization that supports artists, seniors, differently abled, and individuals special needs. 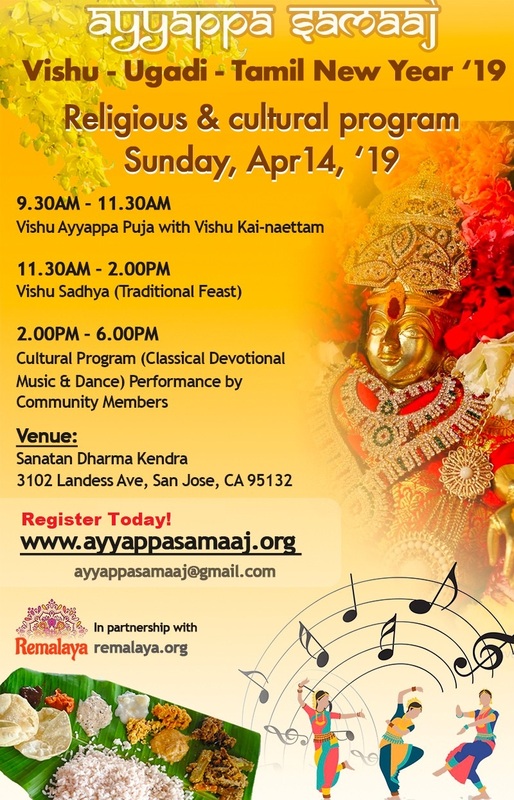 Remalaya's mission is to provide a nurturing environment to these groups, and had worked with Ayyappa Samaaj at the Vishu - Ugadi - New Year event in 2018. Let us have a memorable event at the Vishu - Ugadi - Tamil New year 2019 celebration at Ayyappa Samaaj! 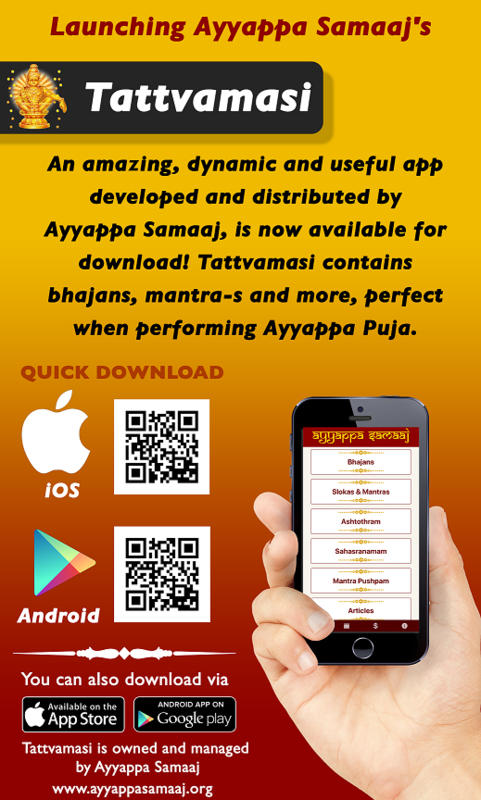 Ayyappa Samaaj is devoted to propagating and perpetuatiing the religious and cultural aspects of the worship of Lord Ayyappa and is deeply concerned about the happenings in Sabarimala. We stand firmly behind protecting the Sabarimala traditions and saving the sanctity of Sabarimala, its deities and Dharma Shastha. We request all sections of society to respect the wishes of the devotees and protect the spiritual, cultural, traditional and religious sanctity of Sabarimala, the holy abode of Lord Ayyappa.